ProofHub’s work management system brings your projects, remote teams and clients under one roof, empowering you to keep things always under your ultimate control. Our work management software works as a central place to manage and run your projects and teams with Tasks to keep things on track, Discussion topics to post updates, share ideas and collaborate with teams and clients, Files and documents to keep the entire information organized, Group chat to ask questions, get answers and continue important conversations seamlessly, Proof and review files and documents quickly, and Track time spent on the projects. 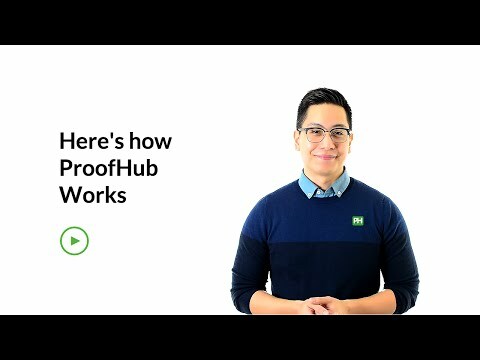 With ProofHub, your teams, clients and all the project communication stays in one place. There's no need of investing in too many different tools to run your business. Our project management software makes it easy to create plans, collaborate with teams and clients, keep things organized and deliver projects on time. With ProofHub’s work management tool you also gain the ultimate control with Gantt charts to create the project plans that’ll ensure timely completion of the projects, assign Project manager to keep a bird’s eye view on project progress, create Custom roles to define access levels for the teams and clients, and Project reports for insights on how the projects are progressing, and how teams and individuals are performing. Set up branded sign-in page, add a color, set a theme, and add your logo to make the account appear just like your company’s look and feel. Gain ultimate control of your projects, know problems in advance and keep teams & project progress on the right track. Save time while working on similar projects by using predefined project templates which you can create.